As the second day of CSW rolled around, there remains a real concern that there will be a repeat of last year, and the commission will end with no agreed conclusions. As I reflected on the feedback about the updated draft conclusions, which were released late the night before, the absence of any single reference to disarmament or to military spending was glaring. The updated draft includes language on women, peace and security, which is heartening – but insufficient, if the connection between arms proliferation, and military spending is not made. This is not new stuff – the connections between militarization and gender inequality, and the pathway to change are clearly articulated in the Beijing Platform for Action. This should be the starting point for CSW negotiations. CSW is meant to provide a forum for evaluating progress, identifying challenges, and laying out the next steps to effective implementation – not regressing on previously agreed commitments. As some of you may have read, the negotiations are being threatened in large part by the influence of conservative actors like the Holy See, Russia, Iran and others. These actors are actively working not only to water down the final conclusions, but to remove all references to already established international commitments and mechanisms that protect and promote women’s rights. This backlash is very real, and presents a very real threat to the ability of women all over the world to hold their governments accountable to their gender equality responsibilities. As civil society, we must speak strongly, clearly, in solidarity and with influence – and we must recapture the process from those interests that seek to derail it. 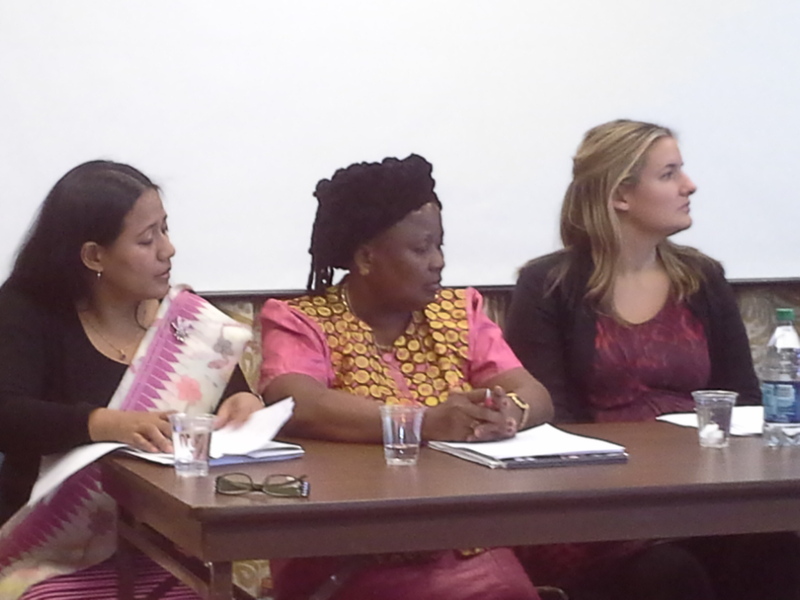 WILPF has been bringing a strong voice and a transformative agenda on gender equality for almost 100 years, and yesterday, WILPF Sweden brought together WILPFers from Nigeria, Columbia, Costa Rica and the DRC to talk about violence against women, and the lethal consequences of arms. As WILPFers we talk often of militarization as a culture, as an ideology, the manifests along a spectrum, and has antecedents in every culture and every society. We talk of how these norms are an anathema to gender equality, to peace and to sustainable development. These connections can sometimes feel hard to grasp, and to impart to others. But as I listened to fellow WILPFers speak to their experience of these issues, and the consequences for women in their own countries, the message we clear and material. The easy availability of small and light weapons for private ownership- and militarized cultures that normalize fear and violent masculinity- present a persistent threat to women’s security in public and private spaces – in conflict and non-conflict situations. As a global community, if we are serious about preventing violence against women, we need a transformative agenda for realizing gender equality- we need to act on the framework adopted in the Beijing Platform for Action – and as Josefine of WILPF Sweden so concisely put it, “we [must] refuse to accept that violence against is a separate issue to arms proliferation”.